You can now eat Tuna as part of your diet plan. We have coupled it up with loads of delicious veggies so that it gets its way into diet foods and remains equally delicious. This salad can not only serve as a side dish for meals but is also nutritious enough to constitute as your lunch if you are on a diet plan. It has the perfect nutrition value because it is high on fibers and proteins and low on fats. Easy to prepare, taking less than quarter of an hour, this salad deserves to be given a try. The sight of tuna mixed with veggies of all colors on Lettuce leaves is one to behold and feast upon. Follow our step by step guide to make a salad that does not take much effort but has a great tatse. Open up the tuna can and drain the water. Put the tuna into a medium bowl. Mix with lemon juice. Chop up the onions. Dice the tomatoes. Chop up the coriander leaves. Mix these vegetables with the tuna in the bowl. Throw in minced jalapeno and stir well. Use salt and pepper for taste. Refrigerate until serving. Put the salad on Lettuce leaves in a plate or simply in salad bowls. Dieting does not mean you get tasteless food. Use your creativity to cut on the calorie sheet without loosing on the taste. Nothing can compensate the delights of good food. 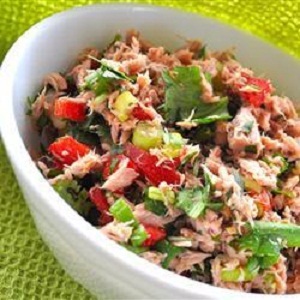 This is a variation of the original Tuna salad recipe which includes mayonnaise and mustard paste. Because it is a diet dish, we have excluded these high calorie ingredients.